This guest post was graciously prepared by Meghan Gallahan Graham, a colleague and fellow Boston University alum who is an SLP at Children's Therapy Associates in Natick, MA. Thanks so much, Meghan!! 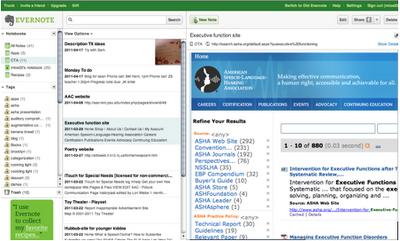 As an organizationally challenged individual I know I will be checking out Evernote. As someone who is constantly trying to stay organized in a world that seems increasingly unorganized, Evernote has been my answer. As a clinician who is always inspired by various materials in the “real world,” I have struggled with how to find ideas, save ideas, and oh yeah…remember them later. I’m sure you’re constantly wondering…What was that website I read about literacy? Or, What was the name of that book that had that great “kickoff”? Who was I supposed to call between 12 and 1 (while I’m inhaling my lunch and planning treatment for the rest of the afternoon)? Evernote is your answer. The best part is that it’s available across devices. I use it on my Android phone, my iPad, and my laptop. I “sync” anything I do, and it’s available at my fingertips. I can easily create to do lists on my laptop or even on my phone, anytime. Above is a website I saved that Sean had referenced a few weeks ago on his site that I thought would be great for a couple students on my caseload, as well as for a presentation I was doing. Evernote has a webclipping function on its desktop version (you can do this on the iPad as well in a slightly different way) that allows me to clip the entire site, or just parts of it that I highlight to save. The tag function allows me to enter text to help me find it later. I added “auditory comprehension” and “tobin presentation” as the tags. Additionally, I placed it in a specific notebook “CTA” my “work” label to differentiate it from my personal notebook where I put recipes, books I want to read, quotes, memories, restaurants to try, etc. Evernote also allows the share function. I can email this note (or even entire notebooks) to others, as well as even make it public. 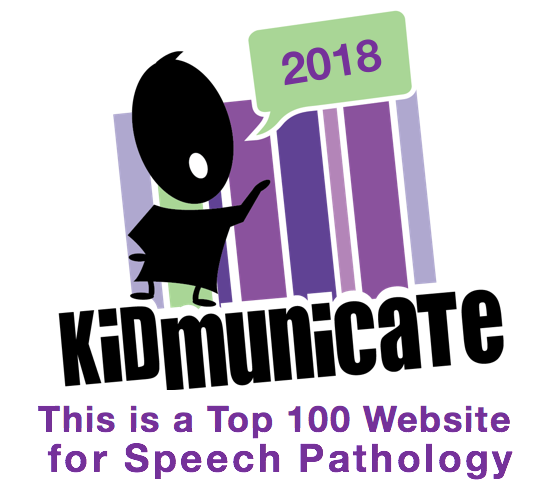 I could email this note to a fellow SLP or teacher who I think may benefit from this website, or even to a parent for a home programming suggestion. I use this webclipping function constantly to save articles from Sean’s site, ASHA, and other sites I visit regularly, and then read them during some downtime. I even will tag it- “downtime” again just to help me find it later. Above on the left, after observing another clinician in a treatment session working on description, I jotted down a couple activities I thought would be a good idea to try with one of my students. I took a quick picture with my phone, and “shared” the picture to Evernote (an option with the app on my phone). Evernote can search handwritten text too. Later if I type in “description” or even “book” in my search, this note will come up, along with anything else that has these words anywhere in the text. I also can email this to my graduate student to give her some ideas for planning treatment with this child. Above to the right is a book that was recommended to me that a friend was reading. I took a quick shot of this on my phone, and sent to my Evernote account. Again, Evernote can search the text in the picture, so I can easily find this later. I could search by “book” (I wrote book in the text of note), “play” or even the author. Anything in the text would allow me to find this later. • Take notes during meetings, phone calls, etc. It functions differently on the iPad and phone obviously, so there is some getting used to for the differences. I have found YouTube videos to be really helpful in understanding. I recommend re-organizing and labeling notes on the desktop/laptop for ease. Overall a minor challenge for the overall benefits of this software. I’ve only skimmed the surface with the capabilities of Evernote. Please visit their website for step by step instructions. I promise you’ll be inspired to get organized and test this out. As a fellow Evernote user, I love how you shared how it helps you. This kind of practical application makes it easier to show colleagues what a fantastic tool it is. 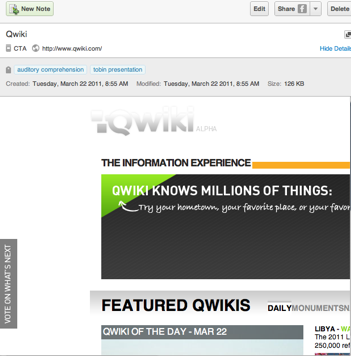 One thing to be aware of, Qwiki has adult content on it. I learned that when I downloaded an app on the iPad and got the warning to ensure I was over 17. I contacted the developer to ask them to consider an education version since it offers text to speech which can be invaluable for some students. Too bad because it's an excellent tool.